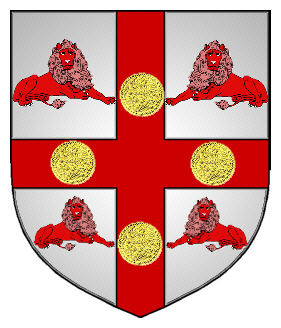 Silver Shield, and on a Cross between four red Lions four Gold Roundels [Discs]. Gold with a Red Chevron. 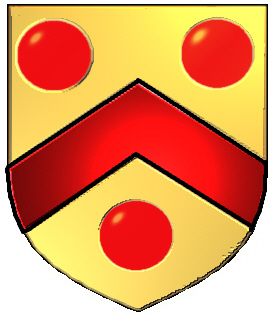 There are three Red Roundels, two above the chevron and one below. Spelling variations include: Rhodes, Rhoades, Rhode, Rhoads, Roades, Roads, Rode, Rude, Rodes, and others. First found in Lincolnshire where they were seated from very early times and were granted lands by Duke William of Normandy, their liege Lord, for their distinguished assistance at the Battle of Hastings in 1066 A.D. Some of the first settlers of this name or some of its variants were: John Rhode settled in Virginia with his wife and three children in 1709, along with Phillip and his wife and four children; John Rhodes settled in Maryland in 1774. Carry Me Back-: the History of the Roddens, Rawdens, Rodens, and Allied Families by Paul G. Rodden, Rhodes-Barnett and Mitchusson-Ingram by Norma Rhodes Ladd. ROUNDLES (roundels): The old heralds have attached various names and significations to these round figures. When of gold they were called Bezants, and represented ancient Byzantine coins. 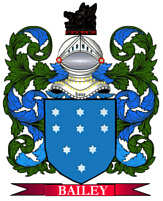 This bearing has been said to denote one who had been found worthy of trust and treasure. The white roundle is called a Plate, and denoted "generosity." The green was called a Pomme or pomeis, and had the same signification as the apple, when purple it was called a Golpe, and denoted a wound; when blue it was a Hurt or wortleberry, known in ancient times as a hurtleberry; when black it was a Pellet, Ogress, or Gunstone, and represented a cannon ball; when red it was called Torteau, and signified the communion wafer or Manchet-cake; when Tawney it was called an Orange, and signified a tennis-ball. A Guze is sanguine in colour and represents an eyeball.